Safeguards for the water and environmental values of the Pilliga have been compromised by politicians acting in their own interests. I'm now an old man following the ancient Chinese tradition of seeking refinement and reclusion in the mountains after a busy working life. My mountains of choice are the Warrumbungles in north-western NSW. Here I'm fortunate to live in a secluded valley with a high and reliable spring from which I can gravity feed my drinking water. The spring rises, at pressure, out of what is known as Pilliga sandstone. To the north is the Pilliga Forest, made famous by Eric Rolls in his classic book about the Australian landscape, A Million Wild Acres. Rolls had a deep understanding of the impact of non-Indigenous settlement and how the landscape functions. One of the primary functions of the Pilliga landscape is to filter water through its sandstone base and recharge the Great Artesian Basin, the largest and deepest artesian basin in the world. I'm neither a farmer nor a grazier. But I now have a 45 year perspective of a place I know intimately and think of as paradise. After a major bush fire burnt me out in January 2013, it's been a privilege to watch a fire ecology recover and to closely observe the growth and succession of flora and fauna. So, there I am living peacefully when the outside world suddenly intrudes. In 2005, a year before Barnaby Joyce bought two properties in the Pilliga, near Gwabegar (described as 'mongrel country'), Eastern Star Gas revealed that after spending $50 million exploring the area, mainly around Narrabri, the company had developed plans for 1100 coal seam gas (CSG) wells dotted across the Pilliga feeding a $150 million pipeline to the Hunter Valley. Joyce and his then wife Natalie bought their first block in July 2006. Sale records show it was purchased from Brett and Traci Worrell for $230,000. In February 2008, the Joyces bought a neighbouring, slightly smaller, bloc from Baradine sisters Natasha and Erin Kelley for $342,000. Joyce says this purchase was to 'square off the block' - making a total 2400 acres. The land bought by the Joyces lies inside the 'petroleum exploration licence' (PEL) areas owned by Eastern Star Gas - before it was sold to Santos. Gwabegar is on the edge of PEL 238 and PEL 428, co-owned by Eastern Star Gas and a company called Comet Ridge. At this time, both companies were issuing positive announcements to the stock exchange in relation to the size of the gas resource in the area. Another company, Gas Star, owned in Houston, released a statement about promising reserves in PEL 433 and 434. This meant that by 2007 - between the two purchases made by the Joyces - CSG companies were boasting of large gas reserves to the east, west and south of the properties. All indications were at this time that a 'gas rush' was coming. In October 2007, Eastern Star Gas appointed former National Party leader and Deputy Prime Minister, John Anderson, as its chairman, to steer its proposed growth phase into a 'major gas developer'. Anderson was working as the campaign manager for Mr Joyce. He left Eastern Star when it was sold to Santos Pty Ltd. Despite their close friendship, Joyce said he had no idea Eastern Star Gas had a petroleum exploration licence over the Pilliga, including his properties at Gwabegar. However, Joyce has been quoted by the Fairfax press as saying he understands the ownership could be 'viewed as a conflict of interest'. Part, or all of the Joyce's properties have also at various times also been in the path of the proposed Inland Rail Project. This is now a funded project that Joyce has been promoting. It is currently aligned with the Santos gas field and subsequent pipeline. Party elders, including Anderson, have been criticised for aligning too closely with mining interests over their traditional farming constituency. Mark Vaile, who succeeded Anderson as National Party leader, became a chairman of Nathan Tinkler's ill-fated Aston Resources when he left Parliament. Former NSW leader Ian Armstrong worked as a lobbyist for AGL. Current President of the National Party, Larry Anthony, is also head of a lobbyist company that have Santos and Shenhua as clients. As Deputy Prime Minister, Joyce lists his property at Gwabegar, west of Narrabri as part of his pecuniary interests. As leader of the National Party, Joyce received substantial political donations from Santos totalling more than $80,000.00 after voting against what was called the water trigger in an amendment to the Environment Protection Biodiversity Conservation Act. This trigger allowed Federal intervention in a State based approval process should water sources be seen to be threatened. Accusations of a conflict of interest are due primarily to claims that Joyce could personally benefit from the Turnbull government's push to develop coal seam gas near the land he owns. Joyce proposed that a landowner get one per cent of the well head revenue of a CSG well. The best performing well in Queensland produces $1 million a day but an average CSG well brings in about $60,000 a day. At that metric, a single well would earn a landholder, pre-tax, more than $200,000 a year, enough to reshape the value of land in marginal areas throughout the Pilliga - like Gwabegar. Joyce, was the Resources Minister, when the Federal Government demanded that NSW accelerate approval of the Santos project at Narrabri, to ease an alleged looming gas shortage. One of many reasons why drilling for coal seam gas in the Pilliga is a bad idea, is that the process contaminates and de-pressures the sandstone aquifers from which my spring-fed drinking water rises. Santos has already been fined for several contamination events and has clearly demonstrated that the company cannot manage the risks associated with extracting coal seam gas. All well casings eventually fail and the risks of contaminating the Great Artesian Basin are even greater and far too high to allow such a marginal project to proceed. Independent expert assessments take time. But, like climate change, the overwhelming expert consensus is against Coal Seam Gas drilling. The fugitive escape of methane, the problem of salt disposal, and community health impacts characterise an industry in denial. In 2017 more than 22,000 submissions objecting to the Santos CSG project in the Pilliga were received. But the project moves ahead regardless. The normal processes that should safeguard our water and the environmental values of the Pilliga have been comprehensively compromised by politicians acting in their own interests. 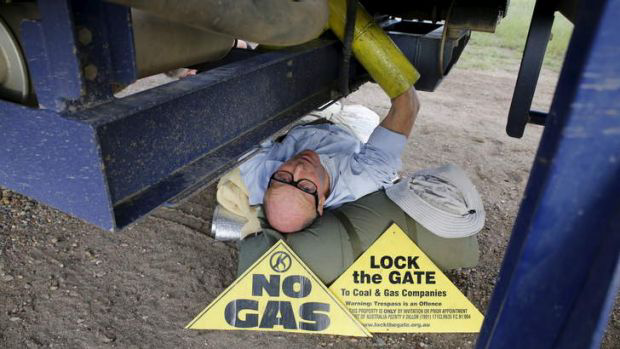 Public disgrace and even jailing of Barnaby Joyce for misconduct while in public office (like Eddie OBeid) might lead to some reform and rethinking of the wisdom of drilling for CSG in the Pilliga. But without a Federal Independent Commission Against Corruption (ICAC), (which Joyce opposes), Joyce's disregard for propriety appears to lend him some kind of golden glow among his champions such as Gina Rinehart. While it can take many forms, corrupt conduct occurs when 'a public official improperly uses, or tries to improperly use, the knowledge, power or resources of their position for personal gain or the advantage of others'. Surely such morally reprehensible behaviour by such a prominent Federal Politician deserves public condemnation - even retribution? That Joyce is under pressure to resign over his extra-marital misjudgements seems to let him off lightly. One of Australia's major ecosystems is being systematically destroyed by self-interest. For me, this is not some distant problem. It's my precious drinking water that's at stake.